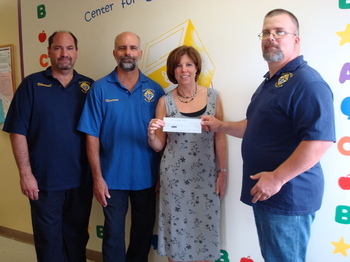 The Arc of Somerset County was the grateful recipient of a $1,855 donation from the Manville Knights of Columbus Council #6573 on Friday, July 23, 2010. Funds were raised through the Knights’ annual collections at three Manville churches during the month of April. Presenting the check to Arc Executive Director Lauren Panarella were Bob Newman, Grand Knight of Council #6573; Vincent Salerno, Financial Secretary; and Andrew Hando, chairman for the fund drive. Bob Newman acknowledged the generosity of the individual donors and explained that the Knights of Columbus organization matched the total collected. This contribution represents the group’s tenth donation to The Arc of Somerset County. The Arc of Somerset County is a nonprofit organization that provides advocacy and services to individuals with intellectual and developmental disabilities and their families. To learn more, visit their website at www.thearcofsomerset.org.